Those words, penned by the late Dr. John Walvoord from his book, Matthew: Thy Kingdom Come, signifies what should be the attitude of Christians today. However, as is too often the case, too many waste time arguing over this aspect of Eschatology or that one because they believe their viewpoint correct and therefore superior to all others. Some make it a point to spend their days attacking and/or castigating those Christians who do not understand Scripture as they do. This ought not to be but the man-made excuses for doing so are just that – man-made and therefore a reproach to God. Nothing good comes from it because Eschatology per se does not impinge upon a person’s salvation. Hundreds, if not thousands, of books and/or articles have been written expressing opinions on the prophetic passages of Scripture. Much of it boils down to whether a person interprets those passages allegorically or literally. A person who understands prophetic portions of Scripture allegorically will go down that path and arrive to certain conclusions based on that starting point. So too, the person who understands those same prophetic portions of Scripture literally will go down that path and arrive to other specific conclusions. The two will never meet and debating or arguing over the matter serves no purpose at all. Certainly, Satan laughs and laughs hard because while Christians are arguing over the meaning of prophetic discourse, the lost are being ignored. What is Christ’s command to us of Matthew 28, the Great Commission? We are living in exhilarating yet dangerous times. Exhilarating because we are rapidly moving toward the end of this current age. Dangerous because the very words of Jesus in His Olivet Discourse are finding fulfillment in society and the end of this age promises terrible things such as this world has never seen or will see again (cf. Matthew 24). There is much there that all Christians should know, understand, and appreciate, with respect to God’s prophetic Word. However, if they aren’t arguing about it, too many Christians are instead ignoring it completely and preoccupied with the daily routine of life and the baubles of this world to hardly notice. If we say we are Christians, should we not endeavor to know as much of His Word as possible before we come to the end of our life here either in death or Rapture? I’m quite certain you don’t know when either will occur for you, do you? Most of us will likely die long before the Rapture happens, but in spite of that, should we not take the time to delve into His Word so that we can understand what He is doing now and where all of this is leading society toward? Certainly, these are good things to know. It goes without saying that we must be about the Father’s business and the more we know of His Word, the more we will understand what He is doing now. The opening paragraph of this article is a quote from Dr. Walvoord, who rightly points out what God’s Word declares that we are to do with respect to the future. We are to look for the physical return of Jesus. We are to expect it. 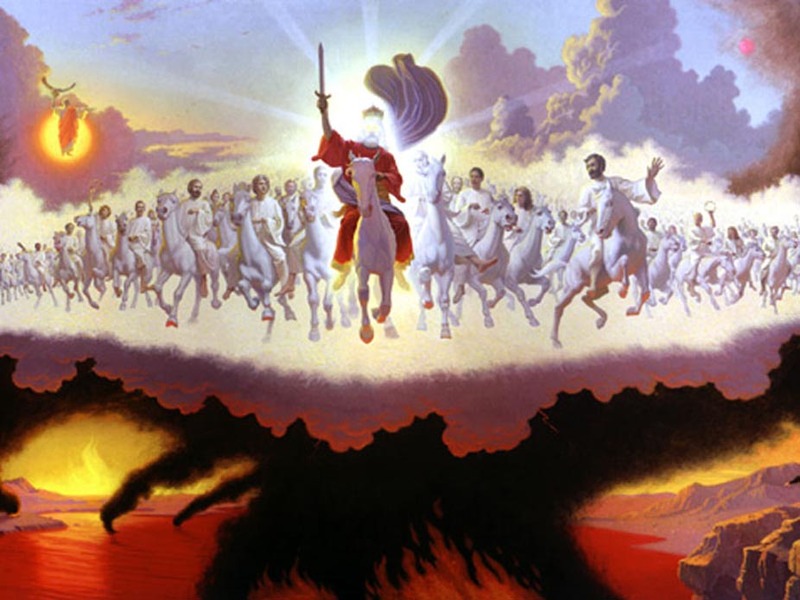 Even though I personally believe there will be a seven-year Tribulation before Jesus will physically return to this planet, after which He will be installed on Zion (Psalm 2) and will rule this entire planet with a rod of iron for 1,000 years, I can still think of that time. I can still look forward to it and even long for it. Isn’t this what John’s words above tell me? But why should I do this, aside from the command of the apostle John to do it? The answer is in the text. Considering the physical return of Jesus – thinking about it, longing for it – will go a very long way in purifying me, won’t it? That’s what the text says, doesn’t it? What does it mean? Notice it says “…every man that hath this hope in him purifieth himself, even as he is pure.” Every person who is authentically saved is already positionally pure. My filthy rags that I might call “righteousness” has been exchanged for God the Son’s perfect and pure righteousness. I am saved and as far as God is concerned, when He looks at me, He no longer sees my filth, but instead He sees Christ’s righteousness because that righteousness has been imputed to my account through faith. As far as God is concerned, I am already pure, but there is a huge gap in what I am positionally and what I am in daily life. I still have the sin nature, therefore I still sin. What can help me stop sinning or not sin so often? Having the proper perspective in life goes a very long way to that end. The more I focus on the return of Jesus, the better my perspective will be. Let’s take a quick peek at Matthew 24:45 – 51, which is often labeled “The Unfaithful Servant.” In this section of Scripture, Jesus points out the problem with the servant who was left in charge of the house because the master of the house was going away on a trip. Look what happens when the servant loses sight of the fact that he was supposed to have an attitude that reminded him daily that the master could return at any moment. 48 But if that evil servant shall say in his heart, My lord tarrieth; 49 and shall begin to beat his fellow-servants, and shall eat and drink with the drunken; 50 the lord of that servant shall come in a day when he expecteth not, and in an hour when he knoweth not, 51 and shall cut him asunder, and appoint his portion with the hypocrites: there shall be the weeping and the gnashing of teeth (Matthew 24:48 – 51). This particular servant got lazy and lost his focus. Notice that once he stopped focusing on the fact that the master of the house could return at any moment (whether the master was going to or not is immaterial), what did he do? He developed a very carnal, callous, and even evil mindset. This particular servant made these terrible mistakes because he started telling himself that his master was not returning soon. It’s the same attitude that happens when Christians start losing sight of the truth of His return. It really doesn’t matter if Jesus returns tomorrow or one hundred years from now. This point from our Lord and the reminder from John tells us that it is our job to stay focused on the fact that one day, He will return to this earth. Is that not exciting to you?! If it’s easier, it is just as beneficial to focus on the fact that today may be your last day on this planet because you may die and be called home before it ends! If that saddens you, you have the wrong attitude. However, most of us do not like to think in those terms. We find ways to grow in comfort here. We look forward to events like birthdays, holidays, vacations, job promotions, new cars, new homes, graduations, fishing trips, and even the birth of a new one into the family, but the return of Jesus? Not so much. It’s fine to look forward to and even enjoy those things, but they should never dwarf the reality of His eventual return. Christians need to develop a focus that keeps eternity in view and this is what John is saying, as is Jesus. The servant who goes through this life focused on himself and life’s problems will soon become overburdened by those problems. He will lose the joy of knowing Jesus as Savior as one who waits expectantly to see Him visibly. He’s too preoccupied with himself and his situation to use energy focusing on the eventual return of the Master. The servant who loses their focus on the eternal begins to place way too much emphasis on this life. It then starts to become easier to allow individual situations to take on lives of their own. Both Jesus and John warn that if we take our focus off future events, we can end up doing tremendous harm to ourselves and our loved ones, as well as creating a very negative example of how Christians should not live that non-Christians will see. Conversely, if we learn to develop a fixed focus on the fact that one day we will see Jesus visibly, physically, and personally, everything else will fall into place because of one very important thing: we will wind up purifying ourselves. How? In our thoughts, in how we speak, in what we do for others. We will begin to move away from ourselves and see the needs of other people and their greatest need is to receive salvation! The servant in the short story above lost his focus because he began to actually doubt his master’s promise to return. He then began to exaggerate his own importance and authority so much so that he ended up beating people and eating and drinking like a pig. He had gone from thinking about the return of the master of the house, to thinking only about himself. He was clearly no good for anyone at that point and his punishment was certainly deserved. Folks, we have got to do better at imitating Jesus. We have got to improve by having the correct focus in life. It is from that vantage point that Christ is lived through us to others. Once we learn that we must focus away from ourselves and onto our God and eternal Savior, a proper focus is created. By having the proper focus, we develop the proper attitude toward God and others. The correct focus comes from understanding that Jesus will return to this earth one day in absolute victory. He will then judge the nations (Gentiles), after being installed as ruler of the world in Zion. After this, His Millennial Kingdom will begin. Many of the things we might long for in this life will no longer exist, so maybe we should start getting used to it now. It is way too easy for Christians to be sidetracked by all that is happening in the world. The world provides a veritable smorgasbord of things that are solely designed to distract us from our true purpose. It doesn’t mean we cannot partake of some of the things in the world or enjoy them with thanksgiving to God. It simply means we cannot be controlled by them and certainly, there are things we should endeavor to avoid altogether. If you went through your day with Jesus physically by your side, would you act differently? Would you speak differently? Would you think differently if you knew He could read those thoughts? Would you possibly go out of your way to do things for others that you might not normally do? As we focus on the eventual return of Jesus (or the fact that we will see Him face-to-face upon our death, which as far as we are concerned, could occur at any moment), John tells us that focusing like this creates a purity within that we otherwise did not have. It is incumbent upon us to literally look for that future time when Jesus will rule physically over all Creation. Is that not something to be excited about? Personally, I can think of nothing greater. Entry filed under: christianity, Cultural Marxism, Emotional virtue, eternity, Life in America, Political Correctness, Politically Correct, Politics, Pretribulational Rapture, rapture, Religious - Christian - End Times, Religious - Christian - Prophecy, Religious - Christian - Theology, salvation, second coming. Tags: 1 john 3:3, imputed righteousness, matthew 24, olivet discourse, psalm 2, second coming of jesus, unfaithful servant, zion.